"Treat younger men as brothers, older women as mothers, and younger women as sisters, with absolute purity" - 1 Timothy 5:1-2. Let this stunning and pure aquamarine cross pendant be a gentle reminder of Paul's admonition to the young Timothy in the Scriptures. 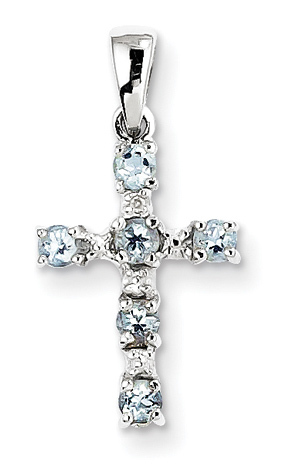 Six genuine, round aquamarine gemstones make up the points of this sterling silver cross pendant for women. Crafted in .925 sterling silver and rhodium-plated for added sheen and refinement. We guarantee our Aquamarine Christian Cross Pendant, Sterling Silver to be high quality, authentic jewelry, as described above.